If you would like to search by Workshops or Webinars, please use the search tool below. Click to view upcoming trainings by catalyst or homelessness categories. For questions, please contact the Florida Housing Coalition at 850-878-4219 or info@flhousing.org. REGISTER There are many types of subsidized housing options available to low income, elderly, and disabled households. This webinar will provide an overview of these subsidized housing options. Subsidized housing also offers opportunities to effectively transition individuals from permanent supportive housing when high levels of care are no longer needed, thus creating a “flow” in the system. Some options discussed will be: Applying for HUD 202/811, submit applications when HCV lottery opens, NED Vouchers, AH/Tax Credit Units. REGISTER The best path to permanent housing is a coordinated response system in every community. 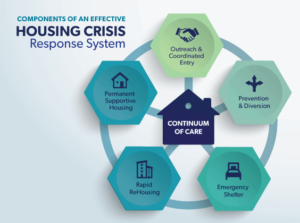 This webinar will provide an overview of the necessary components of the housing crisis response system, and how those components work together to create more permanent housing options. Components include Coordinated Entry, Outreach, Diversion, Prevention, Emergency Shelter, Rapid ReHousing, and Permanent Supportive Housing. REGISTER Many Continuums of Care use prioritization tools, vulnerability indexes, and lengths of time homeless to determine prioritization. Guidance from HUD advises communities to target high utilizers of varying crisis systems in addition to chronicity and other prioritization tools. This webinar will review the HUD guidance on prioritization and how to implement the guidance by leveraging data. REGISTER Housing trust funds (HTF) are funds set aside by local, state, and federal governments that aid in the preservation and development of affordable housing for low income households including homeless families. HTF funds may be used for rental assistance, acquisition, new construction, reconstruction, and/or rehabilitation. The webinar will provide an overview of the funds set aside in Florida and how to access them. REGISTER Housing First is not housing only. After the transition from homelessness to supportive housing, households need support retaining the housing. Successful supportive housing programs create effective teams. This webinar will address division of duties in supportive housing, participant engagement, recovery-oriented services, the role of peer support, and addressing isolation.